Others created programs and opportunities for people with disabilities. Many collected books to ensure that all kids can develop a love of reading. Those are just some of the stories of the 102 youth volunteers – two from each state and the District of Columbia – who have been named State Honorees by the Prudential Spirit of Community Awards, a nationwide program honoring students in grades 5-12 for outstanding volunteer service. The awards program, now in its 21st year, is conducted by Prudential Financial in partnership with the National Association of Secondary School Principals. Each of the 102 State Honorees will receive $ 1,000, an engraved silver medallion, and an all-expense-paid trip in early May to Washington, D.C., for four days of national recognition events. During the trip, 10 of them will be named America’s top youth volunteers of 2016. In addition to the State Honorees, the program’s judges recognized 234 students nationwide as Distinguished Finalists for their impressive community service activities. Each will receive an engraved bronze medallion. More than 500 other applicants were awarded Certificates of Excellence for their volunteer work. Damacia Howard, 12, of Union City, Ga., a seventh-grader at Georgia Cyber Academy, has collected thousands of books in her community for students in Africa, working with a national charity called Books for Africa. Jameshia Attaway, 12, of Indianola, Miss., a sixth-grader at Carver Elementary School, celebrates her birthday each year by throwing a party for children in need and giving them gifts she collects from businesses, local organizations, and community members. My’Kah Knowlin, 14, of Lincoln, Neb., a freshman at Lincoln High School, formed a network of student role models and mentors at nine schools throughout Nebraska to help stop bullying and support victims. 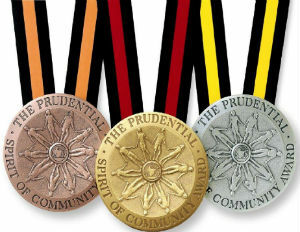 Learn about the volunteer activities of each State Honoree and Distinguished Finalist at http://spirit.prudential.com. With ABFF Awards: A Celebration of Hollywood, airing tonight on BET, we sat down with host Mike Epps to get his thoughts on the celebration and honoring of black Hollywood, and why it’s so important to carve out your own lane. BlackEnterprise.com: What were your initial thoughts when Jeff and the ABFF team asked you to host ABFF Awards? Epps: My initial response was timing is everything—it’s perfect. Right now the business is in an uproar about the Oscars, about black artists being honored for awards, so it was such great timing. I was really honored that Jeff called me to participate in this. This is a big opportunity for me, for us, to be honored for our work. You have hosted a few awards shows. What do you think makes ABFF Awards unique? We’re honoring people who have really paved the way, who have made strides in this business. We’re honoring people that deserve to be honored, that have put in work — some for years and some are new. I think that we as African Americans should have something for ourselves, something that we’re proud of, something that we look forward to. This awards show is it. It’s our homecoming. We’re not always invited, as you can see, to other awards shows, so for us to have our own and to honor our own is always beautiful. In today’s entertainment landscape, with #OscarsSoWhite and lots of focus on diversity, do you feel that ABFF Awards is a necessity? It’s a necessity. It’s a must that we do this, and we’re in a position to do it. What are some of the awards you’re looking forward to presenting? I look forward to seeing Will Packer be honored. He’s been at this for so long, and he’s our golden child. I also look forward to honoring Diahann Carroll. She’s put in work and paved the way for many African American women throughout the years. She did it at a time where we didn’t even get the opportunities that we get now. So, I look forward to honoring her, as well as Don Cheadle. You’ve successfully made the switch back and forth from television and films, hosting and standup. What is the main thing that allows you to successfully navigate these different sides of the industry? First of all, I’d like to thank God for giving me the ability and talent to be able to do this. I’ve always approached my career as one box of goodies. I’ve never separated what I do — it all comes from the heart and my talent. I recognize that it can be hard for us, so I have to keep a number of different irons in this business. If you have the ability to do it, it’s a must. As we know, [the business] is a rollercoaster, where you have high and low points but if you keep different avenues open for yourself and you work at them, you can work all the way across the board. That’s my mentality – if one door shuts, I’m over here opening another one because that’s what we have to do as artists. As black artists, we have to continue to open up other doors and avenues for ourselves so we’re not typecast or blocked and put specific categories. Cable network Fusion has forged a multiyear partnership with All Def Digital to be the exclusive broadcaster of the multiplatform news and satire platform, airing this year’s awards event concurrent with the Oscars on Feb. 28 at 7 p.m. EST. The network will re-air the event throughout the night. The network and All Def Digital are also working to build the awards into a seasonal franchise during the next few years, according to Deadline. Ishawna says that she is happy to represent her brand and dancehall music. The female deejay copped two trophies at last weekend’s Youth View Awards 2016 in Kingston. She won the awards for Favourite Fashion Icon Female and Young Hot & Hype Female. The Downsound Records deejay made headlines earlier this month for her new single “Social Media Hot” where she diss Foota Hype and Nikki Z.